A couple months ago I was able to spend some time in Columbus, Ohio, and in Carmel, Indiana, a city just north of Indianapolis. Since I had some time to explore at night and on the weekends, I decided to try out the bike share programs in each community. Each offered a much different experience which I thought would be a good idea to share here. This post highlights my experience with CoGo Bike Share in Columbus. I’ll follow up with a post about the program in Carmel, Indiana. 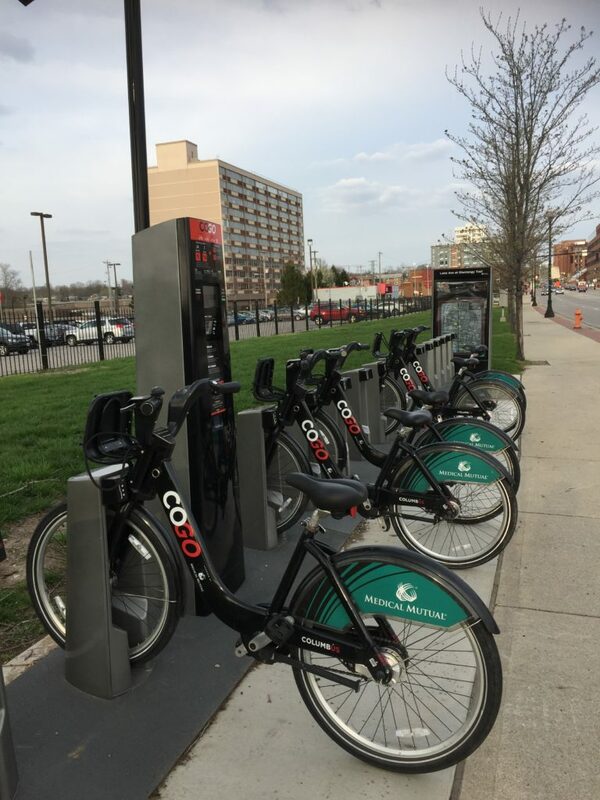 The CoGo Bike Share in Columbus is operated by Motivate, a bike share company which partners with governments and brands to offer bike share services across North America. 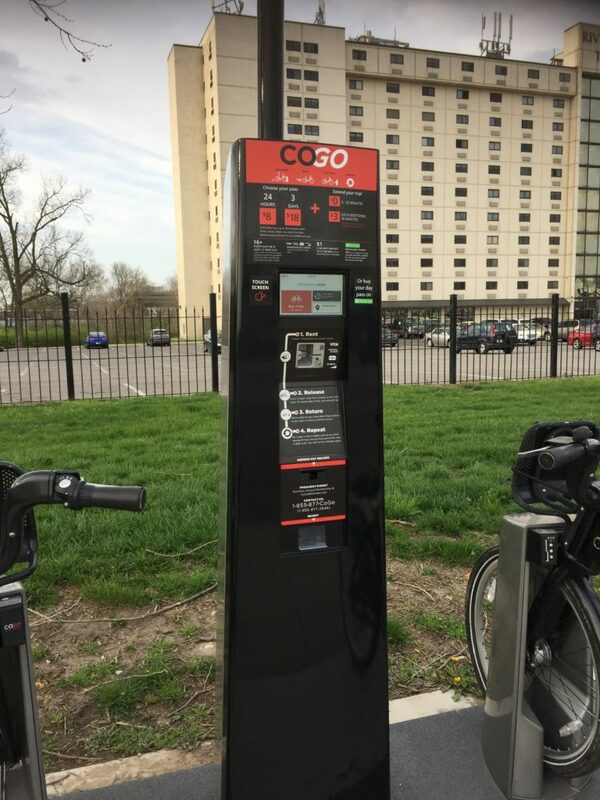 The setup in Columbus is similar to that offered in many other major metropolitan areas -a network of stations with bike docks and payment kiosks located throughout a given area. Payment is made through either an annual subscription, a day pass, or a 3-day pass. Each type of payment covers a 30-minute ride after which the user must return the bike to a station or pay a fee for each additional 30 minutes. In Columbus, a membership is currently $75 while a day pass is $8 and a 3-day pass is $18. All include unlimited 30-minute rides, but if the bike is not returned in that 30 minutes, the $3 fee is applied. So basically to ride the bike for longer than 30 minutes with no extra fees, you would need to pick up a bike, ride it to another station, and return it in less than 30 minutes, and then arrange for your next 30-minute ride. The bikes are locked in a dock at each station as shown in the photo above. So to unlock the bike for use, you use the code you are given when you pay for your day pass. To use another bike after your first 30 minutes, you just reswipe your credit card at the kiosk and request another code. If you have an annual membership, you are given a key which is used to unlock and access bikes. The Transit app for mobile phones can also be used to provide maps of stations and availability of bikes. People can also use this app to purchase passes and generate codes. Because I was staying in Columbus about 10 days, I figured I would try out the bike share program to see if I could use it to get around and at the same time get in some exercise. 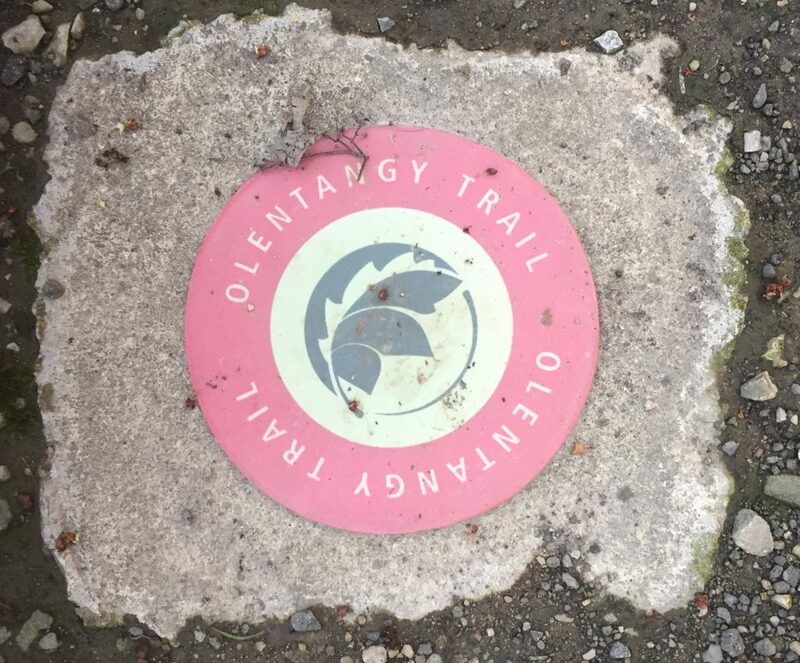 My hotel was conveniently located near the Olentangy Trail roughly a mile north of the nearest bike share station. So I walked to the station one night, bought a day pass, and took off down the trail. 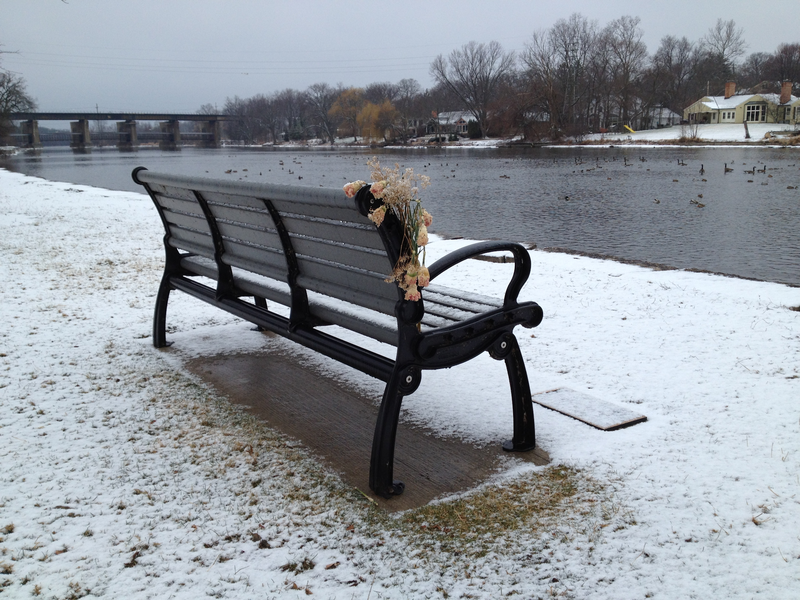 My idea was to try to bike to German town via the trail since I prefer to follow a trail rather than ride in traffic. While the ride was great, as I neared the 30-minute mark, I realized this was a bad idea. There are no other stations near the trail until you get to the downtown area which I found was not a 30 minute ride for me. Part of the problem for me also was when I reached Goodale Street, there was no signage to tell me which way to take to get to the rest of the trail. So I did waste time at that intersection wondering what to do and wandering around somewhat. My phone was not really a big help either. So I turned around and tried to find the nearest station where I could drop off the bike and pick up a new one. I barely made it in time to the one at 3rd and Michigan which was about 5 or 6 blocks from the trail. After getting a new code and picking up a new bike, I headed back to the original station, dropped off the bike, and walked to my hotel along the trail. Relatively easy to figure out the pass system and buy a pass. Also easy to get a code and unlock a bike. From what I could tell, there were always plenty of bikes in all the docks. The bike was easy to ride and in good mechanical condition. I view the fact that there is even a bike share program available as a huge positive for Columbus. The stations were not located in areas near to where I prefer to ride. Station locations and the 30-minute time limit minimizes the time which can be spent riding along off-road trails. The 30-minute limit creates the need to strictly plan a route to ensure bikes are returned on time. The 30-minute limit also minimizes the ability to stop and explore unexpected sights or attractions. Definitely does not allow time for getting lost. I would like to try it again if I was staying in the downtown area and compare that experience to the one I had this year. It seems like it might be a lot different since the bike network is more dense there. If I get a chance to do that in the future, I’ll try to follow up and post something about it. Previous PostPrevious Is it Really Climate Change or is it Sewage? CivilE on Is it Really Climate Change or is it Sewage? Glen Morrow on Is it Really Climate Change or is it Sewage?